Scattered Violence Erupts At Large, Left-Wing Berkeley Rally : The Two-Way Several bouts of violence broke out in an otherwise peaceful demonstration in Berkeley, Calif., when left-wing counterprotesters clashed with right-wing protesters and Trump supporters. A demonstrator is arrested during Sunday's Rally Against Hate, a response to a planned right-wing protest that raised concerns of violence and triggered a massive police presence. Several people were arrested in Berkeley, Calif., for violating rules against covering their faces or carrying items banned by authorities. 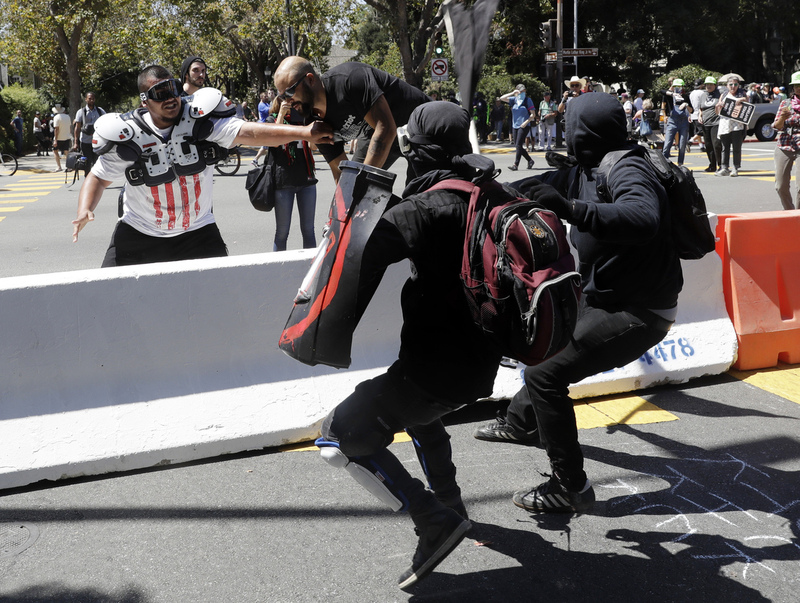 A mostly peaceful demonstration turned violent in Berkeley, Calif., when left-wing counterprotesters clashed with right-wing protesters and Trump supporters on Sunday. Thousands of people held a Rally Against Hate in response to a planned right-wing protest that never got off the ground. During the hours-long event, counterprotesters marched and chanted "No Trump, no KKK, no fascist USA," among other slogans. But several Trump supporters and right-wing demonstrators were also chased away by groups, who chanted "Nazis go home." The hours-long event reached a boiling point around noon at Martin Luther King Jr. Civic Center Park, where a handful of fights broke out. The public radio program Reveal says its host Al Letson, who was covering the event, intercepted a brawl when he saw a man being beaten by a group of protesters. "I was scared they were going to kill him," Letson said. "So the only thing I could think was I wanted to get on top of him to protect him." It's unclear how the aggressors were aligned. But Mother Jones journalist Shane Bauer, who caught the brawl on video, identified the attackers as anti-fascist protesters. "He also said the man being beaten may have been a member of the alt-right," Reveal reports. 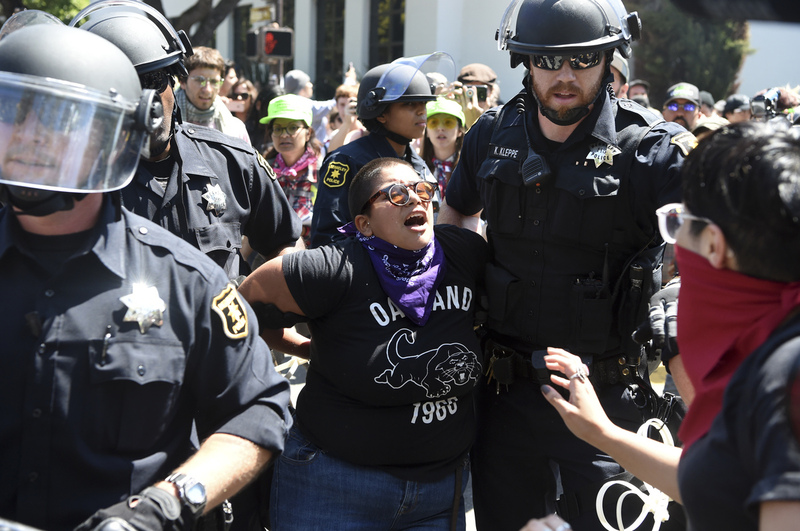 Left-wing protesters far outnumbered the handful of far-right protesters and Trump supporters who showed up in downtown Berkeley amid a massive police presence, reports NPR's Eric Westervelt from Berkeley. The protests follow Saturday's largely nonviolent demonstrations in San Francisco against a far-right rally that was canceled before it began, as the Two-Way reported. When the organizer of that rally, Patriot Prayer founder Joey Gibson, showed up to Civic Center Park, he was chased from the area, "attacked apparently by members of antifa with pepper spray and makeshift clubs," NPR's Westervelt reports. Patriot Prayer founder Joey Gibson (second from left) is chased by anti-fascists during a Rally Against Hate on Sunday in Berkeley, Calif.
By the day's end, police had arrested 13 people, and two people were taken to the hospital, Berkeley Mayor Jesse Arreguin said in a statement, according to Bay Area news station KRON. Many were charged with carrying banned items such as clubs and violating rules on covering their faces, NPR's Westervelt adds. In his statement, Mayor Arreguin thanked "the thousands of people who peacefully and creatively exercised their right to freedom of speech and assembly. Our nation is deeply divided, but Berkeley will forge onward to protect immigrants, people of color and others who are marginalized, and to continue to peacefully stand up for justice."